While capturing a champion getting crowned at this year's Golf President's Cup, take you best swing on your own Sport Court putting green. From September 25th to October 1st in New York, the Golf President's Cup will take place at Liberty National Golf Club. Golfers and participants will take up the challenge of making the ball travel the 43,825,760 total yards. In comparison to how many yards it takes to go around the entire globe, the challenge is to honor No Kid Hungry, an organization that assists in providing one million meals to kids in need. For every dollar that Citi donates to No Kid Hungry, a child in need will be provided with 10 meals. Take a step into providing your children a healthy lifestyle by installing a putting green from Sport Court in your backyard. At Sport Court, we support children getting the resources they need to enjoy the game they love. Our putting greens are long-lasting, and help you achieve the best stroke. Every putting green is equipped with the highest-quality turf for an authentic ball roll and response. From a small practice are to a six-hole playing field, our Court Builders can install a putting green suitable to your own custom dimensions. 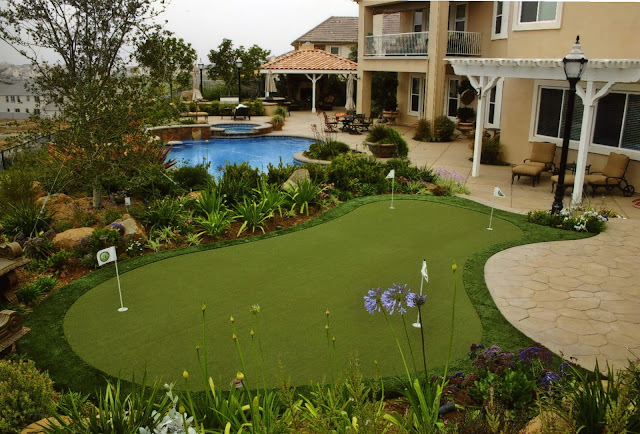 For even more fun, pair your putting green with a game court to expand your family's sporting activities. Create the dream backyard from your family filled with play, memories and healthy lifestyle with the help of Sport Court.